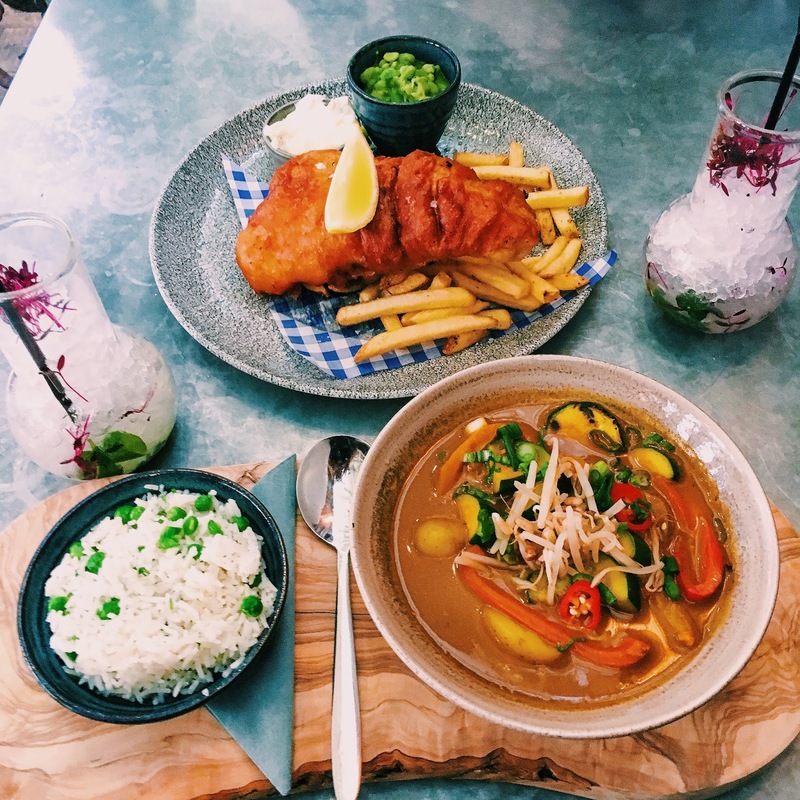 Earlier this week, Jerome and I were invited to The Botanist in Sheffield to try their new Spring/Summer menu, featuring more vegan, vegetarian and pescatarian options. If you follow me on social media or read my foodie blog posts, you'll know that we love visiting The Botanist. They serve up a plethora of food and drinks and it's unarguably the most 'Instagram-able' place in Sheffield. I've also paid visits to their other restaurants in Leeds and Manchester, which are equally as fabulous! I'll start out by stating that none of the staff who were waiting on us (us being Jerome and I), knew that we were there to review the menu. They didn't give us any 'special treatment' just because I was writing a review on their workplace. They were simply friendly, polite, enthusiastic and very accommodating. I cannot praise the staff enough. Jerome and I both noticed how every member of staff was so chatty, informative and professional. Our waiter knew the new menu inside-out and he even took the time to show me the vegetarian options and suggested a few of her favourites. We decided to have two courses, a main and a dessert each. I ordered the Malaysian Curry with coconut rice, which was vegan. Whereas, Jerome opted for a British classic - fish and chips (pescatarian). My curry was divine! Not only was the sauce spicy and flavoursome, the veg in the curry was cooked to perfection. Courgette, potato, carrot, broccoli - literally all of my favourite veg! It was served with a side of steamed peas and cocout rice. Overall, I found the portion size to be more than filling and the whole dish was an absolute steal for the price (£9.95). Jerome also gave me some feedback on his dish: the portion size was generous, the fish was beer-battered and cooked perfectly. He also mentioned that the mushy peas were thick and full of flavour - I've been to a few restaurants before where the peas were watery and bland but these were far from that. He also agreed that the price point was fantastic; his meal was £13.50. Dessert... the best bit! I opted for the Peanut and Chocolate Brownie cake with Salted Caramel and Vanilla Ice Cream. This was recommended to be by our waitress and she wasn't lying when she said it was the best dessert she'd ever tasted. It's the best dessert I've ever tasted! It was rich, indulgent, naughty; everything you'd hope for i a dessert. The portion size was generous (a bit too big for me!). 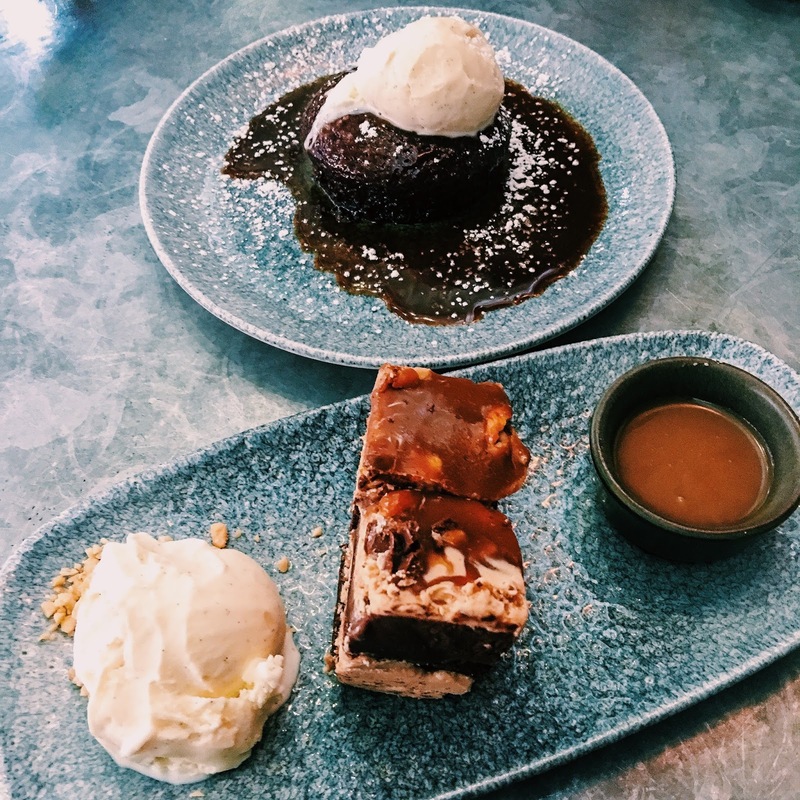 Jerome opted for the Sticky Toffee Pudding with Vanilla Ice Cream - he reported that it definitely hit the spot and was super indulgent. If you've ever visited The Botanist, you'll know that they're renowned for their adventurous and out of the box cocktails. A classic that Jerome and I always enjoy is their signature cocktail, creatively named "The Botanist", with Ketel One vodka, elderflower liqueur and rum. It's sweet and floral with a hint of spice from the rum. It's also very pretty for anyone who likes to Instagram their cocktails or do the classic 'cheers boomerang' - so millennial. Another drink I enjoyed was the Cinnamon and Oregano Old Fashioned. This was my first time trying this and I was pleasantly surprised. It was Bourbon with cinnamon syrup and oregao poured over ice and a cinnamon stick. It was spicy, sweet and smoky - I loved it! It was a tad strong, but nothing ya gal couldn't handle. The Bourbon was really pulling through in this drink, perfect for anyone who loves whiskey. Jerome opted for a fruitier second drink with the Grapefruit Rum Punch. It had apricot, grapefruit, vanilla syrup, pomegranate all mixed with Sailor Jerry Spiced Rum. He rated it highly and said it's a classic for the rum-lovers who also have a sweet tooth. 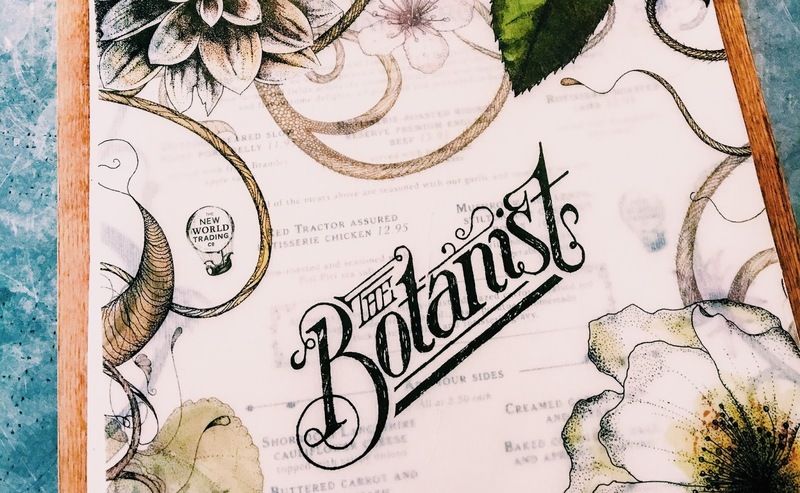 Have you visited The Botanist? I'm heading back to The Botanist for a girls' weekend next week and I'd love some more drinks recommendations! Take a look at The Botanist food and drinks menus for yourself.